Let’s face it, naturally curly hair takes effort. This is not for the faint at heart, the weary, nor the lazy. If you have worn your natural curls for more than one year, I'd say you deserve the title of Honorary Stylist. Wouldn't you agree? To the curlies who have been sweating to make hair magic happen at home, you could take your hair conjuring to another level by adding a hooded dryer to your magic box. Here are five reasons why you should invest in a hooded dryer. Say hello to crisp curls, twist outs, and roller sets. Long gone will be the days of not-so-dry braid outs or the "wash-n-sleep" curls gone wild. With a hooded dryer at home you can wash, and go straight to your hooded dryer for a few minutes of drying time, while you check your emails or prepare for your day. If drying time is a major factor in considering your purchase, choose a dryer with high wattage to get a range of heat options. Editor's note: NaturallyCurly contributor Lindsay Wilson says her hair takes 8 hours to dry, but when she uses her hooded dryer her hair dries in 1 hour. You can see what her Type 3 curls look like when dried with a hooded dryer vs. with a diffuser here. For curlies who love the extra volume, you could give the diffuser a break and instead, opt for a wash and go curl set using Deva Clips or Spilo Duckbill Clips with your hooded dryer. Simply insert the clips where you want the volume and prepare to dry. Set the dryer on a lower setting and lift the dryer a little higher off of your head to allow your hair to expand. When you hair is almost dry, remove your clips, shake, and go. Curlies that opt for “laid” curls can finally get the stretch they've always wanted. Simply shingle product through your hair as slick as you like it. For added stretch at your roots, use Deva Clips or Spilo Duckbill Clips to smooth and stretch your desired areas. Bring your dryer down to cover your entire head, and set on a high flow (the temp does not have to be high). For extra stretch, add clips to the ends of your hair for added weight. After drying, remove clips and with your choice of oil, twirl the ends of your curls for a nice plump finish. Many factors contribute to that crisp salon finished look. You know, that look that makes us say, “Why can’t I achieve this look when I do it?" Sometimes it’s the products, the fancy techniques, the fresh perspective, the tools, or a combination of these factors. The hooded dryer is definitely a major player in the salon finish. There is something very unique about the heat from a hooded dryer. It is considered indirect heat. Based on the dryer type (ionic, ceramic, tourmaline) it could reduce frizz, add shine, protect against damage, etc. To top it off, some dryers come with a cool setting to lock in your set, which could add a few days onto your style. Regardless of dryer type, the hooded dryer produces a crisp, shiny, flawless finish. There are many great benefits to owning a hooded dryer for you to consider. You might just come one step closer to the quality finish you’ve always sought after. 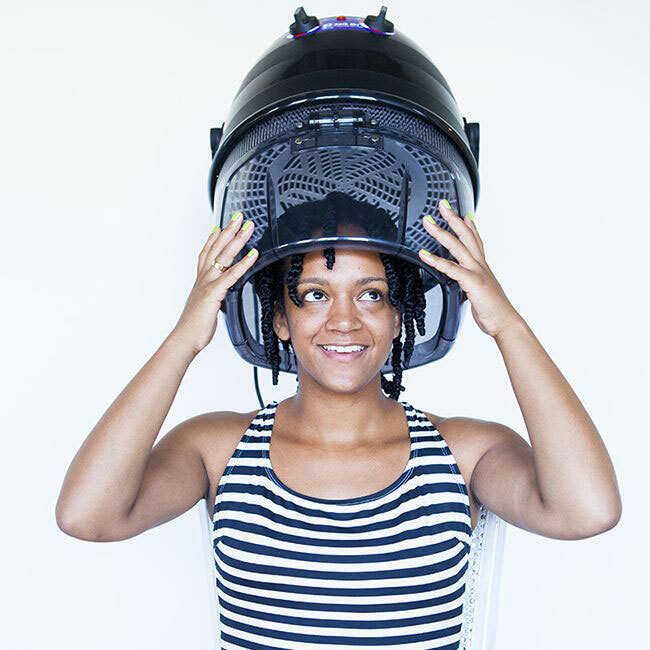 If you're shopping for a hooded dryer, CurlTalkers have used and liked the ION brand from Sally Beauty Supply, the Babyliss Therma, the Pibbs Hard-Hat Dryer and the Ionic Pro Rollabout Tourmaline Dryer.